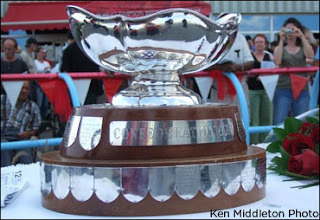 With the Hambletonian in the history books, the action turns back to soph-colt pacers and heads north to Flamboro Downs, where that track’s signature event, the Confederation Cup, handles the first heats-to-final event of the season on Sunday, Aug. 12. Meanwhile, more sophs are going for major bucks at Tioga Downs. Colts and fillies there battle in the Empire Breeders Classic championships. State-breds in New York (NYSS) go at it at Batavia Downs and Vernon Downs and New Jersey-bred freshmen are all over the Meadowlands’ Aug. 10 program. The exclusive Hambletonian Trail blog that covered months of preps for two divisions leading to the August classics has its final entry now listed. 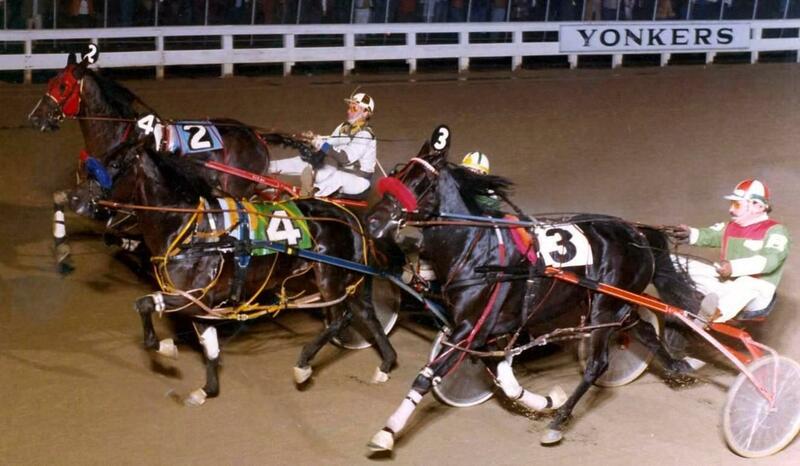 The Hambletonian Society website has the archives for all of the races reported, making it the only spot on the Internet where you can still read about all the horses battling in those divisions. The battles will ensue through more stakes and soon we hope to begin the Breeders Crown Countdown, following all eight divisions more closely as they head for the series of high-class events, scheduled to be presented again this year on a single card at Woodbine. Sunday, Aug. 12, there will be 11 soph-colt pacers in the 2012 Confederation Cup at Flamboro Downs. Among them are Pet Rock, Michaels Power, Warrawee Needy and a supplemental entry, Panther Hanover. That one’s connections decided to put up the money to compete after Panther Hanover’s roaring mile at the Meadowlands on Hambletonian day. “Panther” upset the favorite in the New Jersey Classic, getting a perfect trip from sizzling fractions and winning in 1:47.2. As reported in our weekly update, that was the race where Hurrikane Kingcole broke the record for cutting the fastest three-quarters ever, with a 1:18.2. Caviart Key, Dynamic Youth, I Found My Beach, Mel Mara, Michaels Power, Panther Hanover, Pet Rock, Secretsoftheknight, Speed Again, State Treasurer and Warrawee Needy. We assume that Panther is going to get a lot of support but anyone expecting a repeat performance of his last effort will be tossing out good money for bad. On the Flamboro half-mile, regardless of how this race is drawn, the best possible winner of the final, if not also his elim, is Pet Rock. Just as we liked him in the “Rooney” and he delivered the win at a decent price, he is bound to be overlooked here. The presence of Michaels Power and Warrawee Needy, Canadian heroes both, as well as the entry of Panter, should make Pet Rock an overlay. He has done best with the first-string colts and his class should show again on a half-mile. His price may be better in the elim because if he wins that he will be hit more in the final, so watch his elim field odds for the best strike. The Empire State features its finest this weekend in several divisions of the New York Sires Stakes and the finals of the Empire Breeders Classic (EBC) at Tioga Downs. In the colt final, Bettor’s Edge and Heston Blue Chip headline the pack of nine after their wins in last week’s eliminations. As those two are improving, one pacer has been under the radar. Ron Burke’s Breakin The Law will be looking for his first stakes win all year. 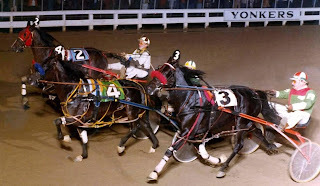 After following the division’s top pacers around the five-eighths oval at the Meadows through ridiculous fractions in the Adios Final, he found enough rally to close and finish third behind Bolt The Duer and A Rocknroll Dance. Given that, he may have a disadvantage if they don’t pace super fast, but if he’s close enough to the pace he may have enough rally to win by a slim margin. In the filly division, American Jewel makes her return after her loss in the Mistletoe Shalee. There are only two horses that have a remote chance to defeat the champion, Romantic Moment and Shelliscape. Romantic Moment has primarily raced on the New York circuit after a failed attempt going against this pack of fillies in the Fan Hanover. But after that effort she has been dominating the division on most of the New York ovals. We caught her a few times as she began her improvement and if she gets the right trip here, she could pace right by American Jewel. As for Shelliscape, she is a hard closer. There would have to be a super fast pace in order for her to win. But since we don’t see that happening, she should only be able to complement the exotics. If she draws a good post, she should get away mid-pack and then she’ll have enough to finish in the top three. Horses to watch in the NYSS at Batavia on Aug. 10, for frosh-filly trotters, are Proclaiming April (most likely the favorite), Crazy Grigio (price may rise due to post and hot one inside of her), Palm Beach Chic (could upset the obvious choice) and Crazy About NY (toss out her last race for a price). Freshmen from both sexes and both gaits take the stage in New Jersey Sires Stakes (NJSS) action at the Meadowlands on Friday, Aug. 10. It’s the second leg of the series. First it’s filly pacers. We tweeted Jerseylicious for you when she won the Sweetheart but she won’t be 10-1 here and she will have to get a trip to win it, as she did in the stakes. We like Miss Lauren for the price in this first event. Next, filly trotters engage in one of two splits. Shared Past is getting better with each race and comes from a green stakes after doing very well in a NJSS from the outside. The second filly trotter split follows and Viva De Vie comes from the Meadows after a brutal trip to a good spot to upset the choices in here. The next race is the second filly pace, where Hilarious Hayley may be overlooked after two Canadian starts. Even though her recent was a huge win, others here will be favored and this Rocknroll Hanover product could wipe up at a price. In the first of three colt-pacer NJSS splits there could be a huge surprise from Rocky Mountain Guy. Toss out his Woodrow Wilson debacle and you see an improving sort that has paced well with the top of this class so far this season. Next, be aware of Rocknmyjeans, who chased the mighty Captain Treacherous before an uneven trip made him look like a longshot with these. That might not be true and we want to be there if he improves as he should, at a good price. Then, the last colt pace finds Don’t Ya Know back after a jump with a better post and a chance to win his third among similar fields he has already defeated. Finally, the other colt trot enjoys the presence of second-time starter Deadliest Catch. These odds will be humungous, we think, since no one will want to play trainer John Duer as the driver and most will consider him too slow to keep up with the likes of probable choice Corky. But those are the very reasons we will chance it.